Two Steps to Solve GWS=CFS=AIDS: 1) Halt HIV Spending. 2) Fund Our Veterans. Problem Solved. : WHO ARE THE AIDS DISSIDENTS? There exists a once-progressive movement of non-conformists who question HIV=AIDS paradigm. Simply put, they are "AIDS Dissidents." AIDS dissidents claim that HIV is not the cause of AIDS. They claim that there is no stitch of scientific evidence proving that HIV causes AIDS. They claim that AIDS is a falsity, and pronouce that HIV, like all retroviruses, is harmless. Dissidents claim that the HIV diagnostic tests are as flimsy as the orthodox paradigm for which it stands, requiring dilution and confirmatory tests, while creating both false-positives and -negatives. Dissidents claim that "HIV/AIDS" is a fraud, manufactured solely to benefit the Rx companies, who get rich pumping toxic medications into patients who do not know better to question them, then those very same carcinogenic drugs --> kill. 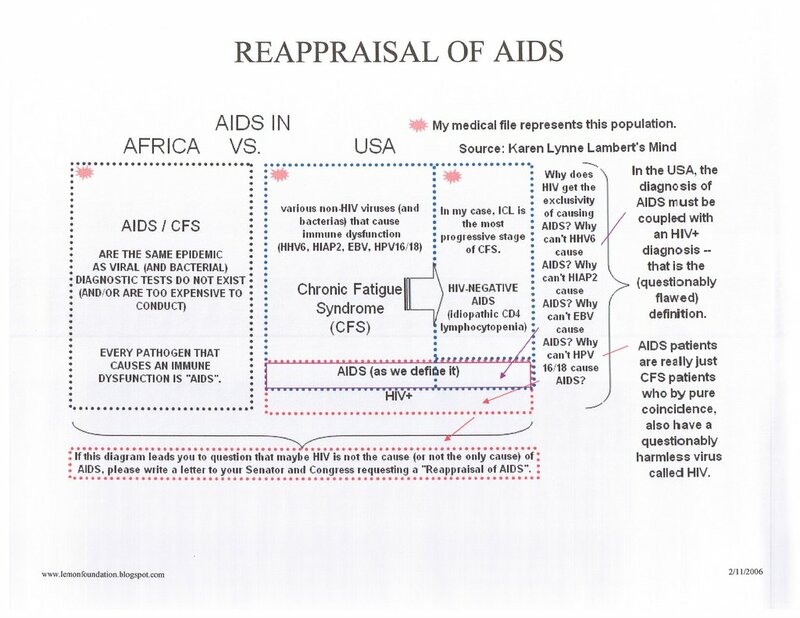 AIDS dissidents claim to want a "REAPPRAISAL OF AIDS," but these purported *thinkers,* and er, "questioners," then stipulate no other pathogens that cause immune dysfunction, cancer, or death. ...claims to be 'rethinking' and 'questioning' when they are not at all. They stopped purportedly 'thinking' when they settled on their own stale, half-baked, toxicity beliefs. HYPOCRITE: repeatedly censor facts about infectious NON HIV AIDS cases, deleting research links, books, and citations off their forums (or burying citations in "off topic" categories) just like the orthodox community, moderating posts in 1984-style (i.e., with no respect for the U.S. Constitution or our veterans, just like Big Brother), all while harassing me in the same EVIL, EVIL manner that the orthodox community treated Christine Maggiore (who, might I add, is one of my heroes, http://aliveandwell.org/). Repeat: QA/RA does to me, exactly, what the orthodox community did to Christine. I have NON HIV AIDS. So, I believe that it is 100% appropriate for me to question whether HIV is the cause of AIDS. One totally insane QA/RA group has been clear that they want no part of an NON HIV AIDS patient in their community (e.g., "You are a distraction to the RA mission. We have a POV (i.e., point of view) to uphold. So, F*CK YOU. F-CK OFF. F*CK YOU."). Their genocidal idiocy is flippin' mindboggling: Er, what exactly is the mission of "Rethinking AIDS," if not to rethink AIDS?? Any legitimate self-proclaimed "thinker" shouldn't have a POV. Why wouldn't dissidents be embracing millions of NON HIV AIDS cases? Why wouldn't a platform, which claims to offer the most "comprehensive, detailed analyses of every aspect of so-called "HIV" and "AIDS," be analyzing the parallels between AIDS & CFS? I especially guffaw when these folks dole-out unsolicited advice on how to start a revolution, as if they have any flippin' clue. QA/RA platform has made NO progress in 30 years, NONE, ZERO. ZILCH. They tell me that they're the "longest-running" groups --> yes, that means you've killed the most amount of people. They're a roadblock, setting humanity back, and should just stop talking. Why can't they just stop talking? It's disturbingly comical when admins try to lecture me -- as if I'd take advice from a bunch of stale nonsense. I don't lack for mainstream respect ---- something these unprogressive folks have never, in 3 decades, obtained. Dissidents really believe that posting on their hideous, repulsive, genocidal forums (which most of the world simply ignores as the utter nonsense, that it is) is a "privilege." then beat you with experience." It gets better.... their "logic" is that I post too much of the same topic (i.e., NON HIV AIDS) ---- as if that's a negative quality of mine. HA! Repetition and constant messaging is precisely exactly what they lack. They cannot even begin to comprehend that if NON HIV AIDS were the only topic posted on their forums, people might actually start respecting them -- maybe even me. These "questioners" have no flippin' clue, what they are talking about. What's really disturbing is these ignorants, even when you tell them flat-out that they are killing people with their theories, simply just don't care. Then they carry-on with their murderous drivel. I think where most AIDS dissidents miss-the-boat is that they're so busy saying "HIV is not the cause of AIDS" pointing to drug toxicity, AZT, benzene, lifestyles, water supply, oxidative stress, etc. that they fail to see that other stealth pathogens (e.g., EBV, HHV6, SCMV, SV40 or Lyme and weaponized mycoplasma, basically all biological warfare) are clearly causing immune dysfunction, cancer, and death. Lifestyle, eating habits, and genetic predisposition are all secondary factors that can expedite one's physical demise, but acquiring a nasty microbe can definitely be a precipitating event. I think where most AIDS dissidents continue to miss-the-mark is that they're so busy saying "HIV is not the cause of AIDS" that they fail to see that there is a BLAZING heterosexual CFS pandemic sweeping across the developed world. (http://cfsstraighttalk.blogspot.com/2005/12/do-i-have-aids-or-chronic-fatigue.html). AIDS patients are just more CFS patients, who only by pure coincidence are HIV+. In other words, HIV + CFS = AIDS. If QA/RAers cannot see that there's something seriously wrong going on with both AIDS and CFS research by looking at a NON HIV AIDS (e.g., me) then they are clearly living in la-la-land. If they cannot see that there is something seriously wrong going on with both AIDS and CFS research by looking at one NON HIV AIDS case that can be epidemiologically-linked --- then they're living in a hypocritical QA/RA world-of-delusion. I really wish that more closed-minded hypocritical dissidents would use my NON HIV AIDS case to expand their minds. Dissidents need to get up-to-speed on the CFS pandemic. I suggest reading Hillary Johnson's book, Osler's Web, as a start:(http://amazon.com/gp/product/051770353X/sr=8-1/qid=1139498368/ref=sr_1_1/104-0661546-9436744?%5Fencoding=UTF8). Chapter 33 is entitled "HIV Negative AIDS." Then when asked: What's the cause of AIDS? After denouncing HIV's involvement, all any dissident would have to say is: Why not ask the CFS establishment? They are the one's with millions of ailing immunosuppressed patients. My quest has always been to unravel the truth, with an open mind (no stipulations attached!). GET OUT OF MY FLIPPIN' WAY! WELCOME TO 1984. --> C'EST LA VIE. My NON HIV AIDS case goes up through the NIH, CDC, White House, WHO, to the UN. I testified federally in Washington-DC, and am published 28 times on 4 continents.